WESTFIELD, Ind. – Step foot into Westfield’s first winery – Urban Vines – and you’ll be met with the tough decision of which of its 14 crafted wines to have poured into your glass. Meet the wine master (or the guy behind the business) Noah Herron, who put his biochemistry degree to work after he found a passion for making his own wine. In 2016 he knew he wanted to open his own winery and vineyard in Westfield but with limited land for sale, he got the attention of property owners the old-fashioned way – by writing letters. Of the 20 people he reached out to, only one responded which is where you’ll find Urban Vines today at 303 E. 161st Street. Doors formally opened May 5 and Herron said the grand opening was “jam packed” with the parking lot overflowing to the grass and to the next door church. Herron said the location was a perfect match - just about a football field away from his home and a few doors down from his other business – Urban Farmer , a company that ships gardening seeds across the county. 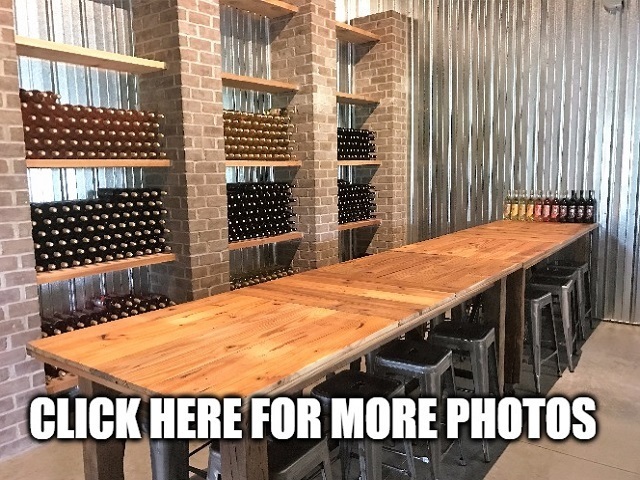 Urban Vines' customers are met with a custom-built wine chandelier that hangs in the middle of the tasting room, several rustic farmhouse tables indoors, a bar ready for flights and a 60-seat outdoor patio accompanied by 2 acres of land for vineyards. Live music plays each weekend and trivia is hosted every other Thursday. Herron said more than 1,000 wine tastings were done in the first two weeks of business, but he said the road to opening the doors of Urban Vines all started with his first business – Urban Farmer. “I guess I like to turn hobbies into companies,” he said. In 2009, the seeding company began in his Broad Ripple bedroom where he sold 10 different seed varieties to small gardeners for $2 each. “It was set right in the recession and it turns out the garden industry is recession-proof because people want to save money and start their own gardens,” said Herron. Soon after graduating from IU, he landed a job at Eli Lilly and Co. and then found another position working in a marketing department. After frustration, he left his job behind in 2012 to pursue Urban Farmer full-time. “It started to slowly snowball from there. I would come home and have one order or no orders and now we’re one of the largest shippers in Westfield. We’ll ship out about 25,000 orders this year,” he said. Due to his reputation with Urban Farmer and a good track record with banks, Herron was able to open the doors of his winery. Herron had been making wine from his home as a hobby and recalls his first batch turning out “pretty good.” His first Pinot Grigio was created from a wine kit purchased from Great Fermentations. Once he got the idea for a winery, he started to learn to make commercial wines. “It’s much different than making a five-gallon batch, so I was really scared going into it because there is thousands of dollars worth of juice in the tank and if you mess up, you have to pour it all down the drain,” he said. Now that Herron has his wine making down to a science – literally - he serves as the sole creator. He said he mostly makes the wine based off his own taste, but there has been a few he wasn’t a fan of that have sold well. “I like making it in larger volumes because I have more tools to play with now,” he said. Herron hasn’t walked down the path to his own vineyard alone. He said many of the other winery owners have helped. “The other winery owners are really nice. I learned a lot from many of them like Easley, Black Hawk and a few others that I can call up at any point,” said Herron. He hopes to one day sell the wine at local stores in Hamilton County and buy more land to plant an orchard for ciders. While these dreams are down the road, the current goal is to sell as much wine as possible. When it comes to managing two businesses, Herron said the journey has turned out well for he, his wife and two children. “I’m definitely learning to delegate more,” he said. A playground will soon be built on the property for families looking to spend the day enjoying the outdoor patio. For now, customers can join the wine club and groups can rent the wine cellar for those with of 20 people or less.